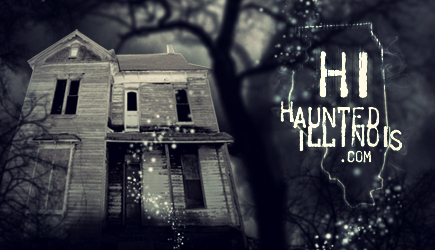 HauntedIllinois.com - Edward Shanahan's Review of the haunted grave site of Chicago Miracle Child Mary Alice Quinn, with her mother's letter. The grave site of Chicago Miracle Child Mary Alice Quinn, at Holy Sepulcher Cemetery in Chicago Ridge, Illinois. 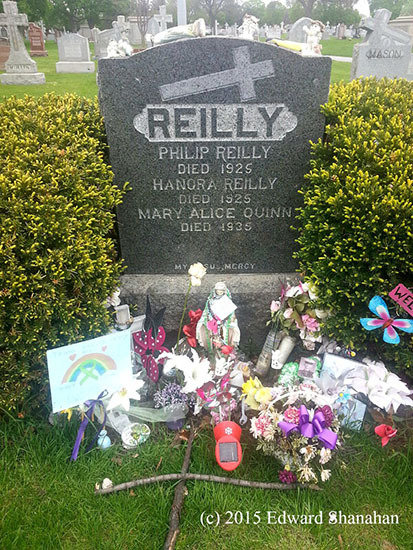 The grave site of Mary Alice Quinn, known to the Paranormal world but also known to the Spiritual and miracle seeking world as the Chicago Miracle Child. A Franciscan Brother has informed me that Mary Alice Quinn is considered an unofficial Chicago Saint. Since 1935, individuals seeking hope and miracles have come to the grave site of Mary Alice Quinn. They do so to pray and ask for a miracle for the sick, children and loved ones. Below is the background about Mary Alice Quinn. A religious figure visited Mary Alice Quinn at a young age. From then on she decided to devote the rest of her young life to religion and Saint Theresa. It became apparent that Mary had the power to heal and she used this power on sick people throughout the south side of Chicago (reason for the name Miracle Child). She made it known that even after death she wanted to be able to continue to help people from beyond the grave. Mary Alice Quinn died tragically at the age of 14. But she was very determined to keep her promise as she appeared to people across the world immediately after her death in 1935 and throughout 1940's. Soon people were visiting her grave site at Holy Sepulcher Cemetery on a daily basis. About seventeen years ago I walked the grounds of Holy Sepulcher Cemetery seeking out her site and approached it with my head down, humble and my heart crying out for a miracle for one of God's littlest angels. I believed deep in my heart in the possibility of a miracle as I experienced healing miracles in the past. This was beyond a simple healing wish, what the child needed was a healing miracle, that would be an act of God, and I was looking for a spiritual miracle, and this was the location I was drawn to ask for the miracle. The miracle requested, was delivered as something Medical Specialist said that they could only call it a miracle. My story has been documented in the book 'Voices From The Chicago Graves' the Southtown Star newspaper and told it on WGN Radio as a guest on the Chicago Now Show, about this grave site and my going there and what medically happened for a child very close to my heart. At times I have been asked to go with individuals to pray for their ill loved ones. That is something in the past that I would attempt to do for those who's loved ones need a healing miracle. I always say that anyone with the desire for a miracle, that the desire must come from deep in their heart. They need no greater strength than their belief in a miracle and a belief in their own higher power. People are overwhelmed even in the dead of winter, with the smell of roses at her grave site. I have experienced the smell of roses at the grave site years ago during the second week of January. 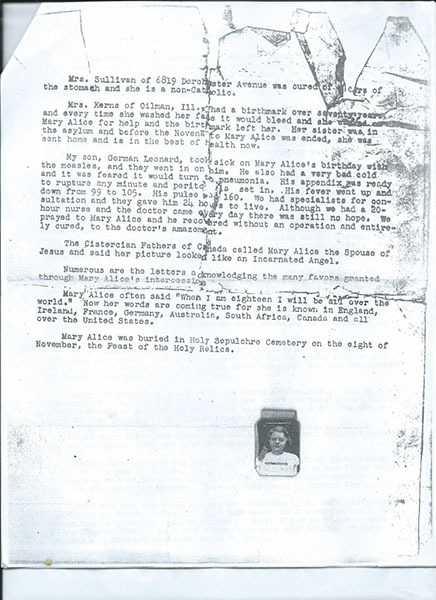 Below is Mary Alice Quinn's mother's story in a letter and includes a photo of Mary Alice Quinn. Maybe it is the respect I have for the Spiritual World and why I do what I do. It is for the people to experience, to know there is a Spiritual Side. I feel I been guided in the directions to follow to provide those experiences for individuals. No classes, just belief in and guidance from the Spiritual World and for others to experience it, as that is knowing it. My respect for the Spiritual World, I believe brings me things, that I was meant to receive. Out of nowhere, an individual made an appointment for a private reading by me. After the reading, she told me this letter was passed down from a family member, as that member was a friend of the Mary Alice Quinn family. Today as I read the letter below, I remember as clear as yesterday, the day I held the child in my hands and wished with all my heart for the miracle for that child. Maybe some of you will have tears while reading the letter from the mother below, as she lost her child Mary Alice Quinn, a child that has become the hope for hundreds if not thousands throughout the years. Mary Alice Quinn's mother's letter. Page 1 of 4. 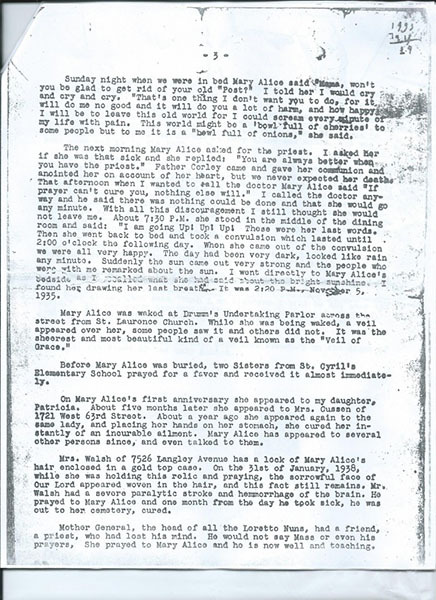 Mary Alice Quinn's mother's letter. Page 2 of 4. 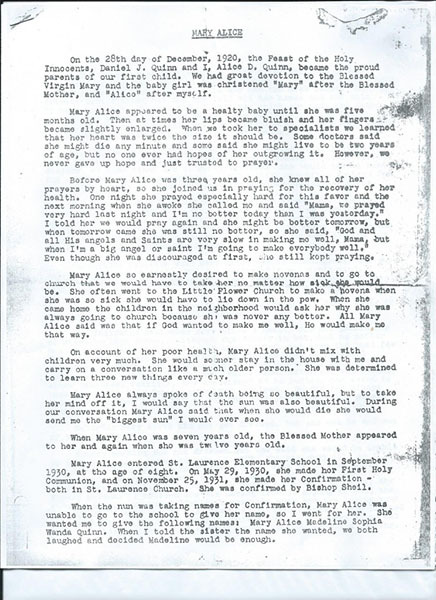 Mary Alice Quinn's mother's letter. Page 3 of 4. 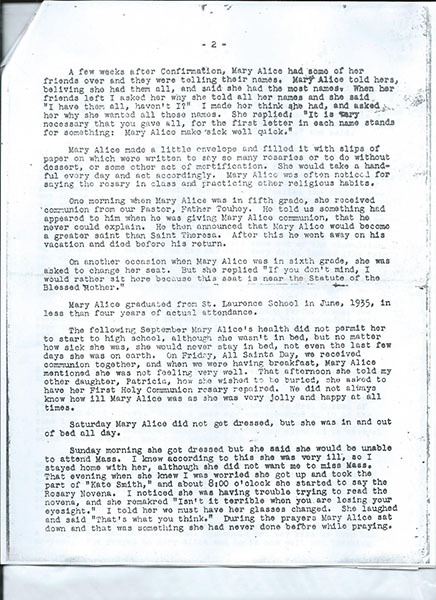 Mary Alice Quinn's mother's letter. Page 4 of 4. How to find the gravesite. Mary Alice Quinn's grave site is located at Holy Sepulcher Cemetery in Chicago Ridge, IL. Holy Sepulcher Cemetery is on 111th Street between Ridgeland and Central. The grave site is in Section 7. As you pull into the cemetery, go down the second road on your right, known as section 2. You will come to an intersection and then section 7. As you drive very slowly in section 7, you will see on the North Side (right side if you followed directions here), a large family headstone with the name Capone. Stop your car there and look a little left of the Capone headstone and you will see the only grave site with two evergreen hedges on each side of a headstone. 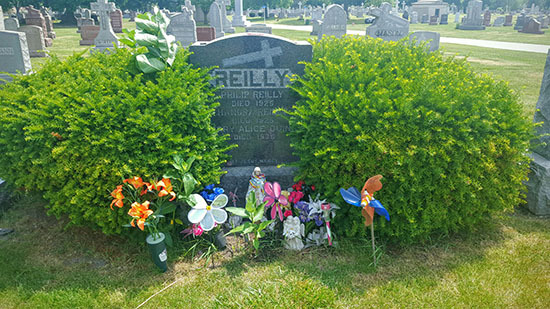 That is the gravesite of Mary Alice Quinn; she is buried with the Reilly Family. © Copyright 2017 by Edward Shanahan. All Rights Reserved. Private Psychic Readings and Spirit Communications with Edward Shanahan held at Senator John Humphrey House or hosting your own 'Design Your Own Psychic Party', information found at the Best Chicago Psychic website.